Three Graces by A.Currell is licensed under a Creative Commons Attribution 4.0 International License. She always tried to be the ideal Grace. Her mother wanted a girl who was quiet and good. Her father wanted a child that “did things.” Her teachers wanted the “straight-A” student. Her church wanted a pure heart. She tried to be the ideal Grace. In fifth grade when she was eleven, she read about the three Graces in Greek mythology. Her teacher, Ms. Wraven (the “w” was silent) gave her a book on the Graces: Aglaea, Euphrosyne, and Thalia. As the Only Child, Grace decided she was oldest, middle, and youngest in her family, all at the same time. Grace tried to imagine herself as all three of the Graces together. Thalia, the oldest, brought festivity and rich banquet. The middle Grace, Euphrosyne, laughter, and the youngest, Aglaea, order and good conduct. 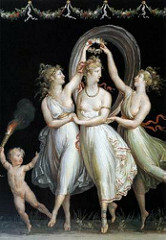 They loved to dance in a circle to Apollo’s music with the nymphs and muses, according to the legends in Grace’s book. Grace tried to imagine herself as the best Grace, as the amalgam of all three of the Graces: festive, laughing, and well-behaved. At night in her room after the lights were out she practiced being festive, mirthful, and orderly. She most wanted to be the ideal Grace. But no matter how much she practiced, she could not get the knack of being all three at the same time. That sounded like an excellent idea to Grace. On the first day she was Thalia, decorating her desk at school and her room at home with cut-outs of wildflowers and rabbits that she printed off the Internet. On the second day, as Euphrosyne, she memorized jokes from a joke book she checked out at the school library. “What is purple and goes, slam! slam! slam! slam!” was one: “A four-door grape.” Her friends Annalisa and Jo laughed at her jokes on the bus ride on the way home. Her parents were not as amused. She tried to tell the jokes she’d learned in the joke book at dinner, but her mother only said to finish eating her dinner so she’d have time for homework before bed, and her dad was checking his email from work on his iPad at the dinner table. Unfortunately, he completely missed the jokes. On the third day, Grace became Aglaea, the orderly and well-behaved Grace. Nothing unusual happened. She tidied her room when she got home from school, even though it was already tidy, because she had always been expected to be tidy by her parents. Day Four: back to Thalia. But when she got to school she decided to talk to Ms. Wraven. Since her parents’ poor response to her jokes as Euphrosyne, she was starting to feel like all her efforts were in vain. She told Ms. Wraven so. “Why is that?” Ms. Wraven asked. “Well, they just don’t get it,” Grace said. Grace thought about this. Everyone needs a sense of humor. She had been trying to be the ideal Grace. But now she realized she needed to be her own Grace. After dinner she got her parents’ attention, and she said, “I’d like to tell you a joke. Listen, please.” They did. The joke didn’t make that much sense, but it was funny. Her mother looked vaguely puzzled, but her father smiled. He said he liked the joke, and he nudged her mother until she said it was a good joke, too. From then on, Grace did her best to be the ideal Grace: her own Grace. Oh, Thank you Dahlia, for your lovely feedback! This is so beautiful. I loved how made such a tidy little story from such an apparently unnoticeable event! Thank you! I think we all have those moments where we recognize the expectations of parents, teachers, etc., and we question whether we will be their picture of the person we are, or if we will be our own person, and how to reconcile the two. I’m glad you enjoyed it! This is amazing, Theresa. I’m probably a bit emotional these days but it makes so much sense. I’m an only child and had been an overachiever since I can remember and eventually I realized I couldn’t only be an academic, the nerd, so I became more extroverted and I learned to be more sociable… I guess, slowly but surely, we start to work on being the superwoman who can do everything and have it all, only we don’t realize we don’t have to be all every single day. 🙂 You have just given me the solution to my stressful lifestyle problem – different days! Awesome. Thank you. Oh, Anne, I hope that you are starting to feel a little better. I’m glad to hear you are taking care of yourself! And, I know what you mean about the only child, I have a friend whose parents seemed to put a lot of expectations on her and she struggled with that while a child and even as an adult. 🙂 Take good care! – and I am honored that you reblogged my story! Thank you for reblogging, Anne! I almost did not post this story, I was afraid it was a little too predictable. Thank you! This is a really awesome story that gave me the solution to my problem… I was going to give up on being a superwoman (lol!) and working on having it all because I was convinced it can’t possibly work. I was doing it all wrong. 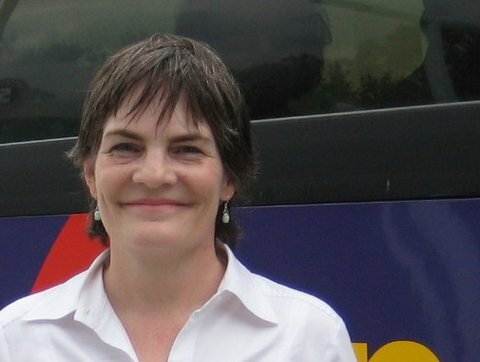 Thank you, Theresa, for this wonderful story. Ah,thank you Anne! It is an honor that you shared my story about Grace. She has pluck, this girl! And you do, too! I’d like to believe so… 🙂 Thank you for giving me inspiration – as always. Much love and hugs to you my dear friend. It’s a privilege and my pleasure to spread this amazing and inspirational story.